It’s no surprise, then, that the company is leading with its price tag, this time out. The second-gen June Oven isn’t cheap by any stretch of the imagination, but with a starting price of $599, it’s a fraction of the cost of its predecessor’s $1,500. There’s also a limited-time $100 discount for both SKUs, so now’s as good a time as any to make the leap, if you’ve been considering it. This certainly looks like a bit of course correction for the company, but June co-founder and CEO Matt Van Horn told TechCrunch that lowering the cost of the device was the plan from the outset. The much higher-cost version of the oven helped the company ramp up and learn how to scale first-generation hardware. The Tesla comparison isn’t entirely apt, however, as June will effectively be sunsetting the previous version to make way for the new, lower-cost model. The basics of the oven are the same as the last generation. I should probably point out that at this point in the conversation Van Horn was cooking a piece of steak in a June on the other side of our Google Hangout. The model has 100 cook programs built-in, allowing it to wear a bunch of hats. It can operate as a convection oven, slow cooker, broiler, toaster, warming drawer, dehydrator and air fryer, making it a compelling choice for small kitchens or college dorms. As someone who eats takeout on the regular, I’d certainly be willing to give it a go, if I had $600 burning a figurative hole in my pocket. 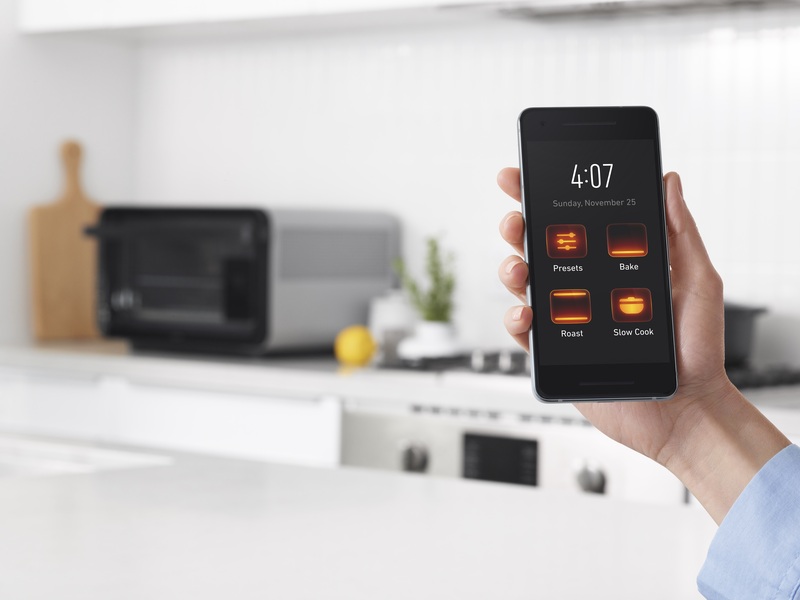 The oven also uses on-board cameras with food recognition AI to determine what you’re cooking and pre-heat its carbon-fiber heating coils accordingly. The company promises precision and speed, cooking food up to three times faster than standard ovens. I’ll say that I’m not fully convinced that the aforementioned food recognition system isn’t a bit of overkill, but at the very least, I suppose it will save you time from having to scroll through all of those touchscreen menus to find the right setting. On-board cameras also mean you can watch your food’s progress remotely — though the top-down view isn’t the most appetizing. Oh, and it supports Alexa, obviously. One of the more compelling features contained here-in is June’s software update pushes, which are delivered over Wi-Fi. That means those who spent an arm and a leg on the last generation will continue to get updates. The $599 will get you the oven, a cooking pan, roasting rack, wire shelf and crumb tray. An additional $200 gets you an extended warranty, three-year subscription to the company’s recipes and three baskets for air frying.